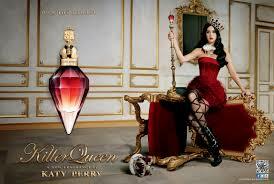 Fragrance Katy Perry Killer Queen is a beautiful royal fragrance for all the noble ladies. The original composition of this strong perfume is destined for modern women who are confident and not afraid to be the center of attention. Perfume is especially suitable for special occasions or wherever there is sufficient space and perfume has the opportunity to stand out perfectly. The fragrance was launched in 2013. Beautifully sophisticated bottle in which it is stored fragrance, has an interesting shape ruby \u200b\u200bcolor and beautifully decorated with gold cap. Get a gem in the form of a scent that will dominate right on your dressing table. Unique perfume Killer Queen is full of juicy fruits, flowers and exotic woods. Wild berries are gently blended with plum and bergamot. Celosia mixed floral scent with its delicious scent of frangipani and a strong smell of white jasmine. Patchouli, cashmere wood tones stroking a wonderful touch of roasted walnut form long-lasting foundation that will accompany you for a long time after application of this charming perfume. Wrap yourself in a beautiful and unmistakable fragrance! For shipping to other EU countries visit this page KATY PERRY Killer Queen EdP 50 ml. Für Versand nach Deutschland, besuchen Sie bitte KATY PERRY Killer Queen EdP 50 ml. Chcete doručit zboží do Česka? Prohlédněte si KATY PERRY Killer Queen EdP 50 ml. Chcete doručiť tovar na Slovensko? Prezrite si KATY PERRY Killer Queen EdP 50 ml. Für Versand nach Österreich, besuchen Sie bitte KATY PERRY Killer Queen EdP 50 ml. Magyarországra történő kiszállításért tekintse meg ezt a termékoldalt: KATY PERRY Killer Queen EdP 50 ml.